Last week we celebrated our boy’s first birthday, and I’m not entirely sure how that happened, since at the time of my last posting he hadn’t yet glimpsed the light of day. But then, a lot of things don’t add up — like the fact that I also have an almost ten-year-old and recently (gulp) rounded another decade. The boy and his fellow creatures have kept us busy, so much so that I haven’t had much mental space to devote to this blog — though I’ve really wanted to, since food has been such a central and sustaining part of this past year. First, I intended to write about all the wonderful meals friends and family cooked and delivered to us in those dizzying and disorienting first days (no, it’s not necessarily easier the third time around). The soups and stews and chilis; the taco kit; the roast chicken and healthy muffins and kale salad; the amazing Korean meal that arrived in its own cooking pot, complete with separately packaged garnishes like tiny, dried anchovies. I haven't forgotten any of them. They all reflected their makers’ personalities and tasted better than any food has tasted in my life, ever. I’ve been hungry a lot this past year, chasing around a little hulk and keeping pace with growing tween daughters and their many activities. It's not always pretty, but I’ve found my way back to the stove. There are tussles over stove knobs. After all, they are bright red and make real fire shoot up if you turn them — cooler than any toy Fisher Price ever made. The baby is not the only dude in the kitchen, either, as Ben has embraced his inner chef, this Christmas eve donning my apron and banning me from the kitchen while he made Boeuf Bourgignan for eight. Our newest member is hands-down the most impressive eater, square inch wise, of the family. We now go through more bananas than the monkey house at the zoo (come to think of it, it kind of feels like we're living in the monkey house). Among his culinary conquests, this baby can count kimchee, sushi, shakshuka, dog kibble by the fistful, ramen, pork paprika, American Girl doll money, and last week, homemade carrot cake. 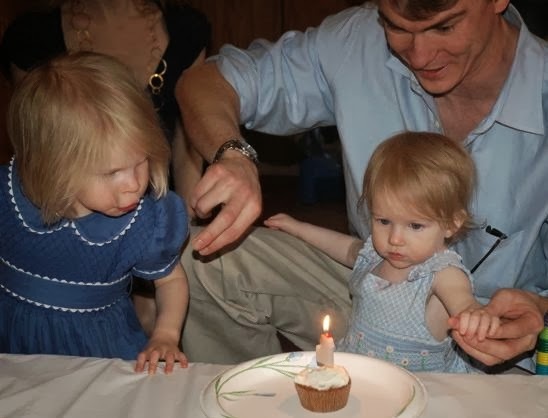 For his birthday celebration, we continued the tradition begun with my first daughter, on her first birthday. Back then, I had wanted to serve something that was healthy yet undeniably a treat — meaning I would grant her access to that devil, sugar. More importantly, I was pregnant with my second daughter at the time and had a fierce craving for this, my most favorite of cakes. I can’t remember exactly how I cobbled together the recipe, but what resulted was a hybrid of a few carrot cake recipes I had found online and in books. I started with good, organic ingredients and packed as many sweet carrots as I could into the mix — there are more carrots than flour in here. I dispensed with the pineapple and coconut, since I can’t get behind tropical flavors in my carrot cake. Likewise, I forewent the nuts, which I do like but can be tricky where one-year-olds are concerned. I added raisins, safely chopped up, for a little texture and natural sweetness. The frosting was the result of an experiment gone nicely – I love the traditional cream cheese frosting but not the pulse-pounding sweetness that often comes with it, so I lightened the cream cheese with whipped cream and added organic sugar, tasting, until it was just sweet enough to get away with — much less sugar than is recommended in most recipes. People big and small raved over the result, so I repeated it 20 months later, in cupcake form, for my second daughter's birthday. 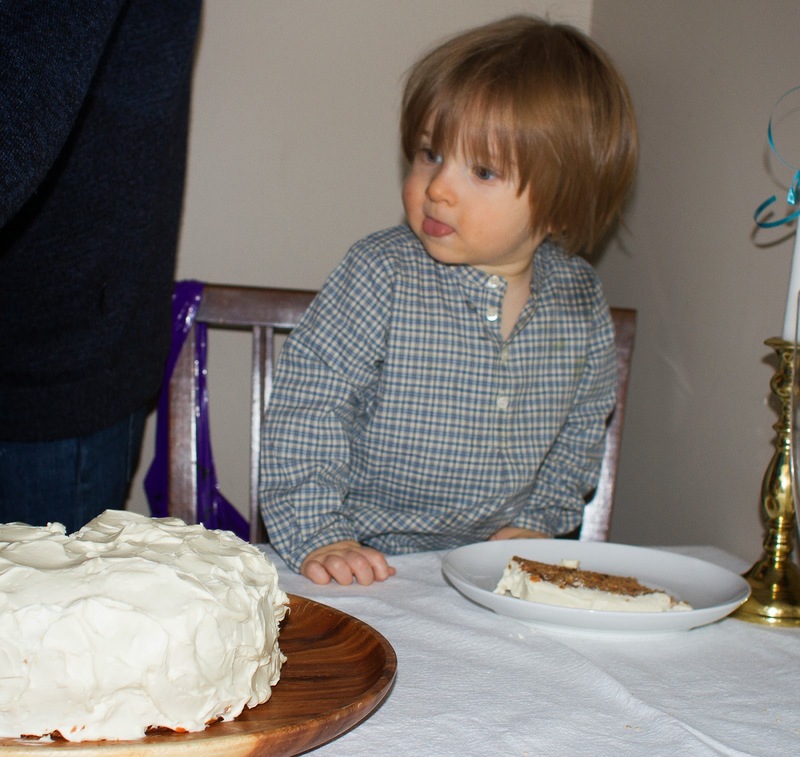 Nearly seven years after that, I vowed not to make our boy the neglected third child, and resurrected the beloved carrot cake. Somehow, in spite of never having written it down, I found my way back to a similar version to the one I'd made before. Party guests snagged seconds and the birthday boy dug in with both hands, not sure how he’d gotten so lucky, and smeared frosting in his face and hair. I think that’s a fair indicator of success, and probably in some cultures a polite show of gustatory appreciation. 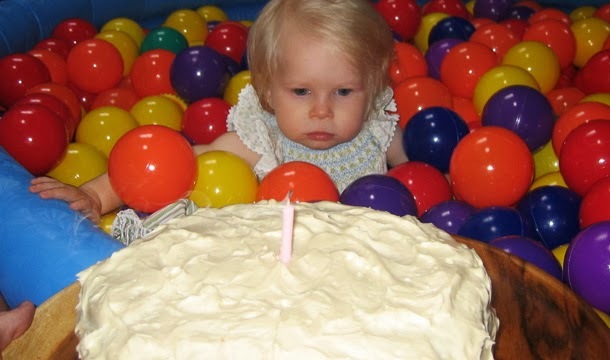 I only hope it doesn't take another baby or the passing of seven years to make this cake again. 1. Preheat oven to 350°. In a medium bowl, whisk together flour, baking soda, salt, and cinnamon. In a separate large bowl, whisk together brown sugar and oil until combined. Add eggs one at a time, then flour, stirring until just blended. Stir in carrots and raisins. 2. Prepare cake pans by greasing with butter then sprinkling with flour; swirl around flour to coat, then knock out the extra. Divide batter equally between pans, smoothing down top with a spatula if necessary. Place in center rack of oven and bake for 25-35 minutes, rotating the rack midway through baking time, particularly if your oven is uneven. Cake is done when it passes the toothpick test and looks slightly browned on top. Remove from oven and cool. 3. Make frosting: you will need two separate, medium bowls. Using an electric mixer (or a strong arm), beat heavy cream and half of the sugar until stiff peaks form. Set aside. In another bowl, beat the softened cream cheese and other half of the sugar until it is smooth. Fold together the two creams gently, along with the lemon zest and about 2 tablespoons of juice, until combined. Taste the frosting — this is important because you may want it sweeter or more lemony; if so, add more sugar and/or lemon juice. 4. When cake is cooled, gently run a knife blade around the inside rim of cake pans to release. Carefully invert one layer onto a plate, then onto your serving plate or cake stand so the top side faces up. Using an offset or regular spatula, spread nearly half of icing onto the bottom cake layer, covering the top and sides completely, then add the second layer and finish the job. I like to make dips and swoops in the surface. Refrigerate if you don’t plan on serving right away.